In this day and age of popular reality TV programming, one can truly appreciate the concept of ‘reality spaniel training’. Nothing scripted. No pre-trained dog simply running through it’s paces, demonstrating the lessons. After all, how do I know that the dog was actually taught using the promoted means and wasn’t handled harshly? How do I know that the training shown actually will produce satisfactory results? I want to see a newbie... fresh-off-the-turnip-truck pup... pure, unformed clay in the trainer’s hands... taught. To see how the youngster - flaws and all - responds and progresses through the course truly reveals whether or not the trainer’s methods are sound - or whether they are just snake oil. 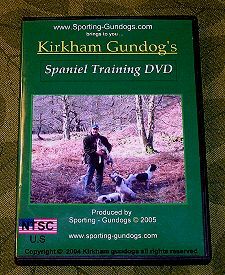 The two-DVD Kirkham Gundogs: Spaniel Training set - plus a bonus DVD: Refresher Course for Spaniels - offers the viewer a gentle, easy to follow, time-tested means to train a spaniel that they can be proud of. Roger Harrison of northwest Lancashire, England, has been involved with gun dogs for over a quarter-century. He trains his English springer spaniels for shooting, beating and his own enjoyment - polishing them to field trial standards. The DVD starts with advice on the basics: selecting, feeding and housing your new puppy, choice of a leash, and so forth. For many in the US, the British method of gundog training seems clouded in an air of mystique. In the US, pups often begin their training at an early age. While on the other side of the pond, the training process seems to be more relaxed. It’s a "let the pup be a pup" attitude. Time is spent nurturing the pup through bonding, socializing, playing and exploring. The thought is that once pup is ‘ready’, mentally, training will progress far easier for both pupil and teacher. Generally, formal training begins after the pup is six months old. Judging from how the young springer, Lennie, interacted with Harrison, it is obvious that they were well bonded and the pup had a strong desire to please his master. The viewer is able to watch Lennie’s training sessions from start to finish. Beginning with simple tennis ball retrieves, they logically progressed one step at a time, making sure that the pup understood what was being asked of him and always taking into consideration his individual temperament, personality and level of maturity. Lessons were reinforced by repetition, building upon each success - and sometimes, even overcoming little problems that cropped up. Harrison does a great job explaining each lesson and candidly assessing the pup, sharing his insights as though the viewer were a good friend. I found the sequence for teaching Lennie to walk on leash - then the progression to walking at heel without a leash particularly fascinating. Having struggled with this in the past, I was quite amazed to see just how quickly he was able to accomplish this with the pup. Another aspect of the program addressed training in a rabbit pen. Although it is a common practice in the UK, most folks in the US are unfamiliar with this training tool. The pen is simply a large enclosure containing various brush piles, bits of lumber and such where the young dog is first introduced to live game: tame rabbits. After giving chase a few times, the young dog is steadied. Bear in mind, that there is a solid foundation of yard work laid prior to advancing to the temptation that live rabbits present. Technically, there are portions of the film where it is difficult to hear what Roger is saying - either due to extraneous noise or turning away from the camera as he was speaking. However, the negative effect is minimal and it does not interfere with understanding what is being presented. The accompanying background music is pleasant, but the few bars are repeated throughout the two-plus hour set of DVDs, which became a little distracting. Rather like finding yourself humming a song that you can’t get out of your head. Whether you are interested in learning to train your own spaniel or just curious about how it’s done in the UK, this DVD set is an excellent choice. The Kirkham Gundogs: Spaniel Training DVD set takes the mystery out of training a spaniel as a hunting companion. It offers the viewer the tools they need to understand the process regardless of whether they have trained spaniels before - or if they are a complete novice. Copies are available from Sporting-Gundogs.